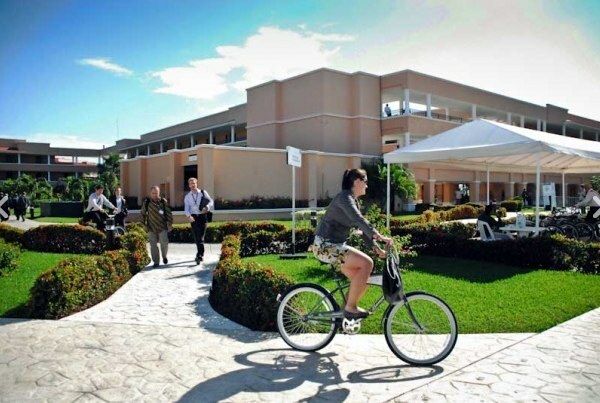 A woman bikes around the Moon Palace Hotel during the COP-16 meeting in Cancun. Photo via cc2010.mx. The Cancun Agreements have been widely praised as a step forward for international negotiations on climate change. Progress was in some ways modest, delaying the biggest questions for the future, like the future of Kyoto Protocol commitments due to expire in 2012. Compared to previous years, though, the transport sector seemed to receive greater recognition for its role in climate change. Transport is a key part of reaching ambitious targets for greenhouse gas emissions reductions. It is significant that many developing countries made pledges for reducing emissions by 2020. These countries are recognizing that transport is key to achieving sustainable and low-carbon growth, and that economic development is achievable without necessarily increasing emissions. One key sign of success was an agreement on climate finance. Delegates from developed countries committed to establishing a “Green Climate Fund” to manage and disperse up to $100 billion per year, starting by 2020, to help developing countries adapt to climate change and avoid carbon-intensive development. Dario Hidalgo, director of research and practice at EMBARQ (the producer of this blog), is more optimistic. The fact that the “negotiations seem to be moving forward rather than remaining stalled is an opportunity; the agreements give hope,” he says. Read the full post on EMBARQ.org.